Playing music is rebellious and mischievous by nature – it takes moxy to stride out on stage and convince a roomful of strangers to enjoy something they’ve never heard before. To turn heads you need the proper tool for the job, something like The Troublemaker Tele. A bound mahogany body with a maple top, custom Cabronita pickguard and lacquer finish? Yep, Fender is definitely stirring up some trouble with this limited-edition release. Powered by a pair of Shawbucker 1T and 2T humbucking pickups that are specifically voiced for their positions, this guitar grunts and growls in a most-desirable way. The 25.5”-scale, “Deep C”-shaped American Professional Tele neck sports a large Stratocaster headstock, along with a 9.5”-radius rosewood fingerboard for enhanced playability, 22 narrow-tall frets and a bone nut. 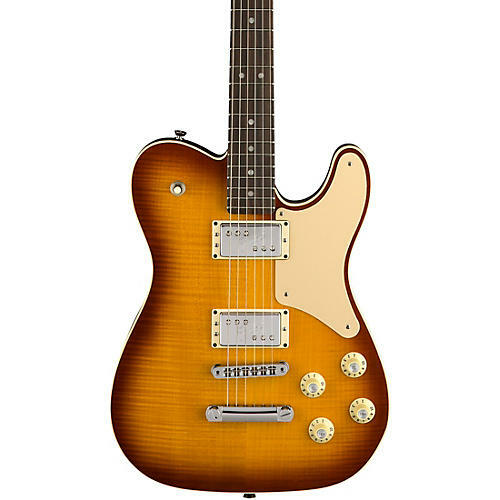 From the 3-way toggle switch on the upper bout to the Adjusto-Matic bridge with stop tailpiece and matching cream Jazzmaster knobs, pickup bezels and switch tip to the pearloid position markers, vintage-style Telecaster Deluxe logo and “Limited Edition” neck plate, this guitar was designed to do one thing—raise a little hell. Don’t be afraid to kick up your heels a bit when you play The Troublemaker Tele—after all, the well-behaved rarely make history. Includes a hardshell case and Certificate of Authenticity.